If one searches metal sites for the info on German/Finnish/Swiss duo Lacrimosa (including the esteemed Metal-Archives) the query may come up empty, and, honestly, it is a shame. Sure, the duo started in the early 90s as more of purely German neo-gothic music, but it has been growing, branching, adding layers, both symphonic and metal, to their sound. It is commendable that Tilo Wolff and Anne Nurmi are on their 11th studio album with Revolution and they can count on a loyal following of fans coming from every walk of life and music outlook. I tend to prefer more extreme things in my music, surely, but can recall a number of occasions when Lacrimosa’s somber opuses were the best company in many of my days of misery. Elodia being my first introduction to Lacrimosa, over the years I managed to collect every one of their albums before and after, only missing their previous Sehnsucht somehow. 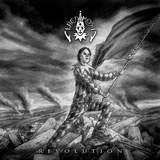 If all those aforementioned metal sites are still coming up blank on Lacrimosa, the band is trying to change this notion decidedly with Revolution. Mille Petrozza (Kreator) and Stefan Schwarzmann (Accept) were brought in to help with the album, but it isn’t only the guest musician roster that is defining Revolution. Sure enough there are compositions on the album which bring to mind the old more typical Lacrimosa, my trusted non-metal companion, where wallowing in the mire (Weil Du Hilfe brauchst) aided by big piano fervent suffering (Refugium) is profound front-and-center. Yet next to some of these dramatic gothic moments Lacrimosa comes up with probably its most heaviest moments to date in the representative opener Irgendein Arsch ist immer unterwegs, and almost borders on Rammstein in the closing album track. There is supercatchy happy polka Octoberfest gothic rocker Feuerzug, preceded by a cool quick piano interlude, but in spots Revolution reaches into industrial metal territory. Befitting then, Tilo’s vocals range from his more customary Cheshire cat caresses to unrestrained wailing. Anne Nurmi’s singing is rather diminished on Revolution, leading only on the English lyrics (as usually) As the World Stood Still for a Day, the track combining military troops marching and Irish melody. Not to leave us without surprise and headscratcher, something akin to rap changes into piercing rock on This is the Night. Production-wise, this is still Lacrimosa, professional, symphonic, with unbelievable attention to detail. The “big” piece on the album, Rote Sinfonie, I may have heard them being more impactful from the band before, but just like a hit Verloren, it showcases the band bordering on Moonspell taking a space flight. In spots crushing, with an active bass, the band also knows how to ultimately soothe the emotions, even if they do so for fleeting moments only on Revolution. Less subdued than many previous Lacrimosa offerings, it remains to be seen if truer metal sites and fans finally take notice.